Experience this Latin variation of Baccarat, a game that relies purely on chance to win. Can you beat the professional at their own game? Try your hand at this South American classic table game and deal a low blow to your friends and banker when you win your fortune in Punto Banco Pro Low. NetEnt has been providing players with some of the best online casino experiences, whether of the slots or the cards kind. Their flawless graphics, animation, and gameplay maintains them in the lead of the industry, with more and more players categorizing their games as some of their favourites. Punto Banco Pro Low comes to satisfy the fans of this cards game with an online version that they can play anytime, without losing any of the realistic casino features. Punto Banco Pro Low is designed with attention to detail, especially when it comes to the betting table. Everything is delimited in an elegant and clear manner, without it being too cramped. You can clearly see all the cards, the possible bets, and the chips you’re betting and winning. That is due to the wonderful graphics and the perspective from which the player views the table. Furthermore, the colours are vibrant and the music is charming, setting the atmosphere for a relaxing experience. Punto Banco is now gaining more popularity around Europe, especially in online casinos. Its rules are very similar to those of Baccarat, so if you’re familiar with the ladder, you’ll have no problem quickly getting the hang of this game. It is played at an oval table, where there are two hands, which are: Punto (the player) and Banco (the banker). Between them, the one which is worth the number of points closest to 9 wins. The numbers 2-10 hold the same number of points as their face value, while Jacks, Kings and Queens are all worth 0 points, and aces hold 1 point. The total value of a hand is obtained by adding up all the points of the cards in it. However, if the total goes beyond 9, ten points are removed from it. Before starting a game, you have to place your bets, with chips worth 0.10, 0.50, 1, 5 or 10 credits. Since this is the Low version of Punto Banco, the maximum bet is that of 10 credits, which is also clearly stated on a little blackboard placed above the betting area. You can place your bet on Punto, which means the Player hand wins, or Banco, which means the Bank hand wins, or on tie, which means both hands will have the same number of points. The last possibility has a payout rate of 9:1. All the other options have a payout of 2:1 and a 5% commission paid to the house. You can also bet on 2 or even 3 of these options at the same time and in any amount you want. Firstly, two cards are drawn for each hand. If the total number of points in the Player’s hand is smaller or equal to 5, a third card is drawn, otherwise it stands. If the Bank’s hand total number of points is from 0 to 3, a third card is drawn, no matter how many points the player’s hand has. If the Banco hand has a value of 4 and the Punto one has a value between 2 and 7, a third card is drawn. The same happens if the Banco hand has a value of 5 and the Punto hand has a value between 4 and 7. If Banco has a value of 8 or 9, both hands stand. At the end, the winner is announced. 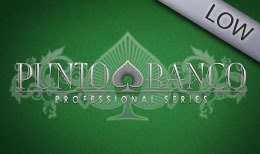 Punto Banco Pro Low is almost the same thing as an online Baccarat game, so the rules are easy to get used to. NetEnt has, as always, made sure the game is developed to high standards and it’s definitely worth a play. Another variety of the Game is available here. DJ have more Fun and Thrilling Casino Games you can visit our Homepage.